There are two types of Peeps-lovers. Those like them only when their fresh out of the package, soft & stretchy. And those that like them once they are a little stale and stiff. I’m strictly in category 1, and my mom is in category 2. But I think I’ve found a sub-category, those like their Peeps homemade! After eyeing this recipe for over a year, I’ve developed my marshmallow making skills enough to have the guts to try it. I don’t own a piping bag, so I just used a large Ziploc freezer bag. I think these would of been a little cuter with the correct bag and tip. Whatever you do, DON’T use your regular marshmallow recipe. I didn’t pay enough attention the first time I attempted this, and they did NOT turn out. Be sure to use the marshmallow recipe for piping. I followed Martha’s tips exactly for making these, except for the eyes. I had planned on doing what theKitchn suggested, and just mix cocoa powder and water and apply with a toothpick, but I was so excited I forgot! (Update, I decided it was cruel and unusual punishment to create peeps but not give them eyes, so I did it and had another photoshoot the following day) I’m proud that some of them came out pretty cute! They didn’t all turn out this cute, some were definitely not photogenic. I would like to try this again, as I got better at it the further I went along. While making these, about halfway through, I needed to pop the marshmallow in the microwave for a little softening up. Don’t leave it in there long, just a couple seconds is fine. I made these on a cookie sheet with 1 inch tall edges to catch all the stray sugar. I had a hard time coating them completely in the sugar. I found though, these were pretty easy to pick up and just dip the uncoated parts in leftover sugar granules once they had dried for a little while. If you need help forming the shape after piping, keep a small bowl of water nearby and dip your fingers in it, then smooth the marshmallow to the shape you want. It’s pretty easy I swear! This marshmallow recipe is nowhere near as sticky as regular marshmallow recipes. I had a lot of fun making these, and they weren’t nearly as hard as I imagined they would be when I first saw the post. I definitely recommend you giving it a try! Transfer marshmallow mixture to a large (14-inch) pastry bag fitted with a 1/2 inch (No. 11 Ateco) tip, and use immediately. 4. Make eyes with either royal icing, or cocoa powder mixed with water. Which type of Peeps lover are you?? Wow – they’re so cute! I’m completely impressed. These are fantastic. What a cute idea! I’m not in either category. I don’t like Peeps at all. They trick me every year…all of their marshmallowy, sugary deceit…and then I take a bite and remember that I can’t stand them. Homemade ones might be something I could do, though. 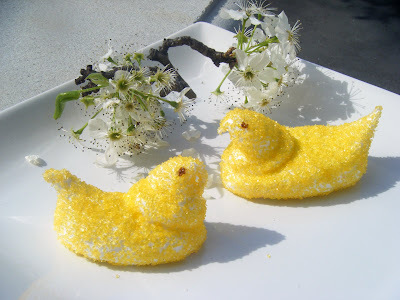 I’ve never seen or heard of a recipe for homemade peeps before! I will definitely have to try it. Soooo cute – great job! Okay don’t freak out but I’ve never ahd a peep. LOL, really, not sure why. Yours came out terrific! You go girl! Erin you’re gonna be the marshmallow queen. Bakerella has cake pops and you’ll have marshmallows. Remember me when you blow up! So cute!! They’re more adorable than the store bought peeps. I am so impressed… And i am a peep lover of the stale variety. But i have respect for the fresh out the package type! i’d be tempted to add some kinda extract to them. something. anything. 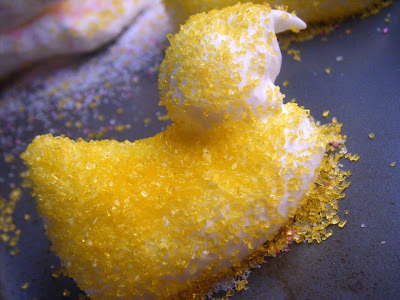 I’m not a peep fan, but yours are adorable. I might have to reconsisder my opinion of peeps. My four sisters and I ALL like them tough and chewy. We open the bag as soon as we buy one so they start getting “seasoned” and ready to eat!